Top Rank's CEO Bob Arum has continued to criticize last Saturday's performance by Mikey Garcia. Garcia, a four division world champion, moved up by two weight classes to challenges IBF welterweight champion Errol Spence at AT&T Stadium in Arlington, Texas. 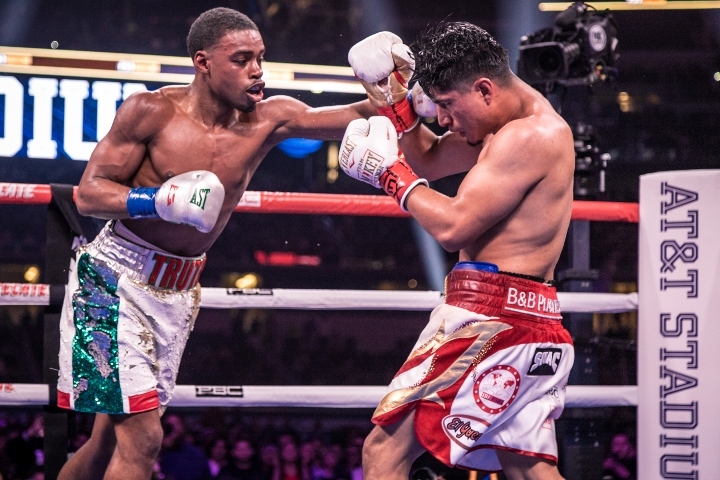 Spence dominated Garcia over twelve rounds for a very lopsided unanimous decision. He won every round on all three of the official scorecards. Since leaving Arum, Garcia's career has been pushed by Al Haymon's Premier Boxing Champions. "For me, Mikey Garcia was there just for the money, I never gave him a chance against Spence, but he took the fight saying that he was going to try to win, but he just went there to survive," Arum said to ESPN Deportes. "In 1974, Carlos Monzón (middleweight) of Argentina fought with one of the best welterweights in history, Jose Napoles. Napoles was aware of his disadvantages, he went out to fight and ended up getting knocked out. I think with García, if you're getting money from people, you go out and fight, you're not in there just trying to survive." Arum cautions that unlike last week's contest, next month's ESPN Pay-Per-View, featuring WBO welterweight champion Terence Crawford defending the belt against Amir Khan, will be a real fight - because Arum expects Khan to go all out. "When Amir fought with Canelo, in the beginning, he was winning, but eventually the size [of Canelo] was imposed on him and he ended up getting knocked out. He fought like a man, not just someone who takes money and tries to survive," Arum. Khan will last as long as Crawford allows him 2. Will be like a Snake Vs. a Mouse. Arum would still be singing the same tune even if Mikey won. He just can't accept garcia left him for pbc. Move on Bob, and I hope your man amir would live up to your hype. Correct title should be: Arum smiles to the bank. Got this chinless mudda****a who has a braindead following of retards thinking he is a good fighter going to get destroyed by my champ. [QUOTE=Robi13;19607188]I paid for Spence vs Garcia... I won't pay for Crawford vs Khan. That's as simple as I can put it. [/QUOTE] Why? Khan fights are ALWAYS exciting.